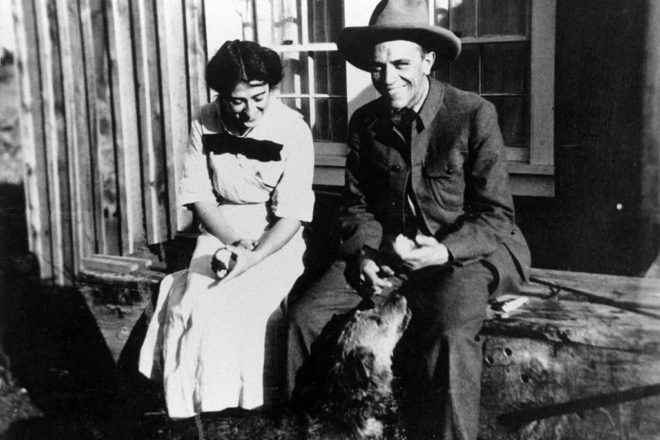 Estella (left) and Aldo Leopold. Public-domain image. Celebrate Aldo Leopold Day and the 70th anniversary of A Sand County Almanac with a showing of Green Fire: Aldo Leopold and a Land Ethic for Our Time on March 2, 3 pm, at Crossroads at Big Creek. The Emmy Award-winning documentary traces Leopold’s life journey, which led him to develop his “land ethic.” Refreshments will be served at the program, which is free and open to the public. Enjoy an encore presentation of Wisconsin Water from the Air March 1, 2 pm, in the Collins Learning Center’s lecture hall. The documentary runs about an hour. On March 2, 9:30 am – 3:30 pm; and March 3, 1-3:30 pm, try out the Ski for Free program, which lends, free of charge, an array of ski and snowshoe equipment. When trail conditions permit skiing, visit the volunteers in the Crossroads Maintenance Building, who will fit you with equipment. The Door County Master Gardeners Association will continue its lecture series on March 5, 7 pm, with “Sustainable Vegetable Gardens.” Presenter Kristina Beuning of Sunbow Farm will discuss how to conserve and preserve your vegetable-garden ecosystem by focusing not just on what you grow, but how you grow it. She will cover water conservation, soil building, plantings that support pollinators and permaculture principles. The program will take place in the Collins Learning Center’s lecture hall. The Collins Learning Center, 2041 Michigan St. in Sturgeon Bay, is open 2-4 pm daily and during scheduled events.